While we may not be the Academy, we know what we like. When we first started the Red Band Project, the one thing I knew for certain was that I loved movies. Never did I think that the words that would appear on this blog would ever go beyond my family or a small circle of friends. Oh how funny life is sometimes. Through Red Band I’ve come to know, read, and respect fellow Hawaii movie lovers; who each have their own unique voices when it comes to writing and talking about films that they see and love. As we finally get set to close the door on 2013 tomorrow with the Academy Awards, I’ve gathered as many of these local cinephiles as I could and asked them to tell us which films they enjoyed the most from the past year. Please enjoy. I wish I saw more movies this year (I haven’t seen 12 Years a Slave yet). But from a limited sample size, the one film that stands out for me is GRAVITY. It’s either the biggest small movie ever made or the smallest big movie ever made. An indie spirit in a blockbuster body. A simple story of survival framed in an immersive, big-screen experience. It’s pure cinema. A film so visually ground-breaking, it shifts the paradigm. Don’t be surprised if you see a 13-minute, continuous space-battle shot in the next Star Wars. In 20 years, this is the 2013 film people will still be talking about. I loved Short Term 12 and that’s saying a lot cause I usually hate movies like this. A story about a bunch of social workers for troubled teens. Yeah, totally my action movie, comic book hero thing, right? Much to my surprise, at a certain point in the movie, I was reduced to tears. And I haven’t cried in a theater since E.T. phoned home. Yeah, I’m old. My favorite film from last year was Ben Stiller’s The Secret Life of Walter Mitty. Not only was it visually stunning with gorgeous picturesque sequences but the story had heart and I connected with Mitty on a personal level. Essentially, stories that resonate with me are ones that actually alter my perception of life afterward. It’s a tall order, but Walter Mitty achieved this, quietly and beautifully. I guess I just love how the film makes you reflect on life and how you choose to live it. Now, excuse while I book my plane ticket. I’ve always been a fan of films with a little bit of an edge so while Gravity did blow me away and was the early choice for my favorite film of 2013, I have to go with The Wolf of Wall Street as my ultimate pick. I’m a fan of anything by Scorsese and his team-ups with Leonardo DiCaprio have all been cinematic successes. DiCaprio especially ups his game in this film and gives what I feel was the best performance of the year. Part Boiler Room and part Goodfellas, The Wolf of Wall Street had the most impact on me this year and I can’t wait to see it again. For me, it was Gravity. Very few films genuinely qualify as “experiences,” but Gravity unquestionably makes the cut. And for a 3-D film to engross and mesmerize me, a 3-D skeptic, is even more unusual. Not the strongest story, I confess, but nonetheless an achievement in filmmaking, an exhilarating ride, and something that may only reach its full potential on the big screen. I often doubt the long-term viability of the mainstream movie industry, but films like Gravity will keep me coming back to the box office. And as for my favorite film of 2013? Come back tomorrow when I go toe to toe with The Academy and list my favorite films of 2013 (or just click here). Once again, thank you to all who contributed! Interview: Dane Neves – Giant Monsters Attack Hawaii! Director/producer Dane Neves operates the puppet Zillabong while shooting his latest film, Giant Monsters Attack Hawaii! Dane Neves’s short film, Giant Monsters Attack Hawaii!, will be screening with Jurassic Park this coming Monday, November 7th as part of Consolidated Theatres’ Hana Hou Picture Show ‘Movie Monster’ edition. The Red Band Project sat down with the director to talk about his film leading up to its debut. Red Band Project: For those not familiar with your background can you talk about your work with puppetry and how it’s a prominent feature in this film as well as some of your other works. Dane Neves: I’ve been a big fan of puppetry in movies since I was very little. Films like Labyrinth, Dark Crystal, Gremlins all the Muppet movies, and Star Wars (the original trilogy) have been great successes without the use of CGI, which is, sadly, overused these days. Puppets = practical movie magic, things that audiences feel they can reach out and touch. Although CGI does do wonders, some movie characters shine much more as live human-operated puppets. That’s why all of my non-human characters are in-camera puppets. RBP: The puppets that you use are unique to your films. Can you talk about how you come up with each puppet, their “look,” and what is involved with physically creating them (does creation limit design?). DN: There are three hand-held monster puppets, one man in a suit monster and a remote controlled robot in this film. When designing a puppet, the character must first be conceptualized on paper. I had four concept artists (all UH art/animation students) draw their own interpretations of each of the four monster characters featured in Giant Monsters Attack Hawaii!. I picked the best designs out of those and sent them to Sonny Vegas (credited as Eddie Horn), a professional puppet maker who lives in Chicago. It’s Sonny’s job to build these puppets for a human (or two) to operate. He tries his best to match the drawings and they are really close (you can see some of the concept art here). The puppets are made out of latex to give their skin a realistic look. The puppet in [my previous film] The Green Tie Affair was conceived in the same way, but he was made out of Antron fleece (a.k.a. Muppet fleece), which allows for easy color dying. RBP: Getting to Giant Monsters Attack Hawaii (GMAH), how did you come up with the premise of the film? DN: I always try to come up with premises for movies that all ages can enjoy, that appeal to the geek in all of us, and that represent Hawaii in a positive light. Pixar shorts were my main inspiration because they all feature an underdog protagonist and they are less than 10 minutes long (the shorter your film is, the more a film festival is likely to screen it). As for the actual concept, I realized that Hawaii has never been the target of a disaster flick…but it has so much potential for that. 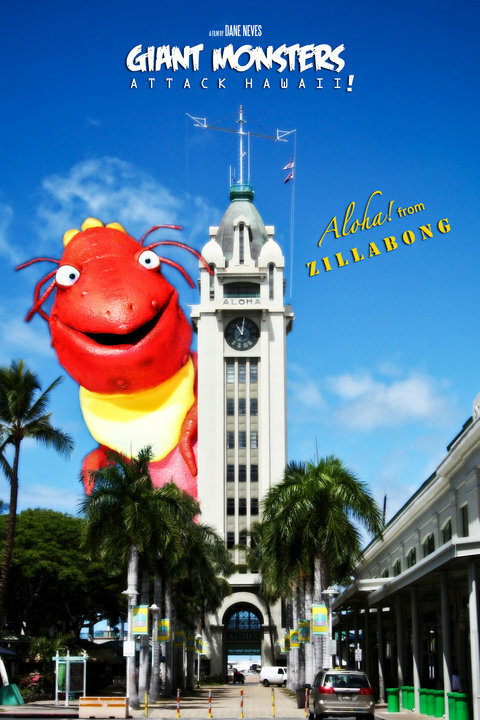 “Family-friendly Godzilla in Waikiki” became my pitch line. RBP: In the plot outline you reference Godzilla and Cloverfield as films that GMAH answers to. Are the monsters in the film inspired by any specific movie monsters? DN: These characters in GMAH are cliche movie monsters. You’ve got the commanding demon-like monster (Abercrumble), the sea monster (Cruehl), the flying insect (Maulister), and the amphibious one (Zillabong). Notice that their names are parodies of famous clothing brands: A&F, Ruehl, Hollister, and the oddball of the bunch: Billabong. RBP: How does this film compare to others you’ve done in the past in terms of scope and production? DN: Twice the scope, twice the number of people working on it, six times the amount of time it took to complete it. A normal short film usually takes about 2 months to shoot and post/edit. This one took a year. We did have some visual effects (note that none of the characters are fully CGI…I still practice what I preach) and that is what took the longest to finish…I only had one guy working on it. Zillabong with his voice actor Grant Uchida. RBP: Along with being the director, in some ways you’re also an actor in the film since you operate some of the monsters as well. Can you talk a little about what’s involved with working with the puppets and what it takes to capture their performances? DN: Being a puppeteer is no job for a weakling. You need to be crouched down in a slew of awkward positions, holding the puppet up with one arm for endless amounts of minutes staring at a video monitor and trying your hardest to keep the puppets eyes looking at the right spot on screen while making it lipsync to pre-recorded dialogue, opening the mouth on every vowel. It hurts, to be honest. Zillabong was actually the only puppet that could be operated by one person. Abercrumble and Cruehl needed two, three, or even four people to work. RBP: I noticed that for both GMAH and your previous film, The Green Tie Affair, original music was composed for each. What made you decide to go with an original score/soundtrack, and do you have a background in music? DN: To avoid having to deal with copyright issues, I figured I’d just compose everything myself. Doing that is one of my favorite parts of the production process because it allows my creativity to peak, no limits. Classic Godzilla film scores (heavy on the horns) as well as the Wall-E score (which incorporated a lot of futuristic orchestral music) were my main inspirations for the soundtrack. I’ve been playing piano since 1994…17 years. RBP: Puppetry in film seems to be making a comeback, first with Forgetting Sarah Marshall and then this year with two films; a great documentary Being Elmo: A Puppeteer’s Journey and The Muppets–both being released within a month or two of each other. Can you venture a guess as to why we’re seeing a resurgence and what it is about puppets that people find entertaining? DN: I think it’s making a comeback because of all the fans that grew up with puppets in the 80s and 90s. We’re all adults now with real jobs and bills to pay. Just a taste of nostalgia is all we need to get excited and bring these things back into the limelight. I will always cherish when my mom bought me the VHS of the Muppet Movie and seeing/hearing Kermit the Frog sing “Rainbow Connection” on a log. I will always cherish the transformation of a Mogwai into a cocoon then into a Gremlin. I will always cherish seeing that Tyrannosaurus Rex’s eye dilate while harassing those kids in that stalled car. These are the puppets the movie-going masses hold dear to their hearts. RBP: I know that right now you’re busy with getting GMAH out there for people to see. Once this is done, do you know what your next project is or what you want to do next? DN: The Hana Hou screening will be GMAH’s public premier. That is just the beginning. A lot of people assume that once a film is wrapped, that’s the end of it and the director moves on to a new project. In actuality, promotion and exhibition of a film (feature or short) is a job in itself. I will be spending the next year sending this short film off to as many film festivals as possible. I have a lot of cool ideas in mind for my “next” film, but none that really stand out and pop. I don’t want to be spending months on end working on something mediocre. When the right time comes, I will make another film. For now, I’m strapping myself in and hanging on for the ride with Giant Monsters Attack Hawaii! If you want to be one of the first people to check out Giant Monsters Attack Hawaii! tickets are available for Monday’s Hana Hou Picture Show at the Consolidated Ward 16 Theatres via Fandango. Traci Toguchi with Ralph Macchio (aka Daniel-son) from The Karate Kid Part II. In this special to The Red Band Project, Guest Manager Valentino Valdez sits down for an interview with local ‘renaissance chick’ (and actress) Traci Toguchi. When the Hawaii International Film Festival (HIFF) announced they were bringing The Karate Kid Part II back to the big screen for the 25th anniversary (as part of HIFF), I was stoked. It’s such a cult hit, especially here in Hawaii, and I have fond memories of watching it with my family in the back of our shag-carpeted Chevy Malibu station wagon at Kam Drive-In, as well as re-enacting every scene with my sister and nephew. I was compelled to seek out the only person I knew, personally, that was in the movie–-local ‘renaissance chick’, Traci Toguchi—to get some behind the scenes scoops. Her role in the film (she’s credited as ‘Girl Ringing Bell’) was not only a turning point in the movie (Sato sees the light! ), but a turning point in her career. I sat down and talked with Traci (and by “sat down and talked”, I mean, emailed her questions and waited for her to reply) about her experiences on The Karate Kid Part II, as well as catch up on her other projects. Was The Karate Kid Part II your first film? Was it your first “Hollywood” job? What was it like working on such a popular movie? Can you describe some personal experiences you had with the stars of the film? It was a dream come true. My sister and I kept Karate Kid posters of Ralph Macchio on our bedroom walls, so everything – from the audition process (standing and crying, hitting an imaginary bell in a room at the Ilikai Hotel), to the callbacks (on set with many other kids – all needing to climb the tower and cry), to the filming process (did some of my own stunts and had a stunt woman!) , to the premiere in Hollywood (my mom and I got to attend!) – was surreal. From Day One, Ralph was so kind, thoughtful and professional. We shot that bell tower scene a zillion times (not only in Hawaii in Kahalu’u, but also in Los Angeles in a movie studio parking lot). That required much rehearsal and getting wet, cold, and muddy. After every take, everyone would rush to Ralph, but he’d tell everyone to help me first, and let me to go first to take a hot shower (and clean off for the next take). He made sure I had hot cocoa. I’ll forever be grateful for his kindness. One of Traci's scenes from The Karate Kid Part II. When my part was extended, and my mother and I went to LA to continue filming. We were in the Shuri Castle set as the shot was being set up, when the line was created for me, and Pat was enlisted to help me pronounce the line, “If not for you, I not be here” with the appropriate accent. He was funny, professional, focused… I recall seeing him many years later at a Perry and Price morning radio show appearance after I sang. He was shocked to hear me sing for the first time. He made some one liner joke like he did when he played “Al” in Happy Days that made me crack up. He was and still is classic. Being able to have been directed by Rocky director John Avildsen continues to be one the biggest honors of my life. He took a chance on me, and gave me the opportunity to do more in the film than what was originally scripted (a featured extra part). He was incredibly helpful, warm, and as you can see from his work, brilliant. The qualities I mentioned in the handful above were recurring and consistent on the set. I was fortunate to have worked as an extra many days to see some aspects of the movie making business at a young age. Even the extras shared a bond, because of the spirit of the cast and crew, but also because of the spirit and nature of Hawaii people. What other local actors were in the movie besides you and Danny Kamekona? Interesting question. Quickly Googled. Looked through the IMDB list, but uncertain if any of the others were from Hawaii (perhaps some of the G.I.’s?). Unfortunately, many large principal roles for big productions – both film and TV – are typically not cast in Hawaii, which means Hawaii actors don’t have the opportunity to audition for the larger roles. In LA, actors can stay “fit” by auditioning for big productions – depending on the time of the year – every week, if not every day. When large productions like Hawaii Five-0 stay for a bit, they provide Hawaii actors the opportunity to work on their craft. We are immensely grateful when this happens. Were all your scenes filmed in Hawaii? You and Tamlyn Tomita were also in Picture Bride. Was that a coincidence or did the Karate Kid connection have something to do with that? Total coincidence. 🙂 Also around that time, we had come to share another thing in common — winning a pageant. Tamilyn was a Nisei Week Queen before starring in The Karate Kid Part II. Please tell me about your role in Bait [a short film featured as part of ‘The Short List’ at HIFF]. I played “Rhonda,” the daughter of the characters played by the great Hawaii actors Dann Seki and Blossom Lam-Hoffman. It was such an honor to be amongst this small cast (other actors included Pomai Brown of 50 First Dates and veteran singer Marlene Sai). Please tell me about your upcoming Hawaii Five-0 guest spot. What was the experience like on the set? My character is Mrs. Lasko. My husband (played by Kevin Yamada, who’s also from Hawaii, but also resides in New York City) and I are victims of a home invasion. Our scene is with McGarrett (Alex O’Loughlin) and Lori (Lauren German). The director was the talented Larry Teng. Larry was professional, articulate, and helpful. Alex and Lauren were so easy to work with. They were also professional, funny, kind, and as you can see on the show, very talented. Like Bait, I knew many of the crew from other local (film, TV, commercial) productions, so it was like being at home. The entire experience from Day One much like The Karate Kid II (and Bait, come to think of it), was incredible. The people were professional, kind, and bright individuals who work well as a team. I feel so blessed to be a part of it. Any other film or TV projects in the works? Nothing I can mention now. Regardless, I’m always studying and applying different acting techniques and learning as much as I can (I also teach these techniques to kids, which helps me a lot too). You’ve also had success on Broadway. Would you do Broadway again if given the opportunity? What roles would you love to tackle? Supergator! Tell us how you got involved with this project and any interesting experiences you had on the set. Were you scared of the Supergator? And what happened to that guy you were tending to at the end? The girl never came back with that first aid kit! Hahaha! Actually, this was a great project for me, as I didn’t have to audition. One of the producers contacted me (or my agent, can’t recall which came first), and said I didn’t have to audition with the credits I already had. Flew and got to spend the night in Kauai after the filming, so it was über sweet. Thankfully, I didn’t need to “interact” with the gator, as others did. I felt bad for those that needed to act like they were being attacked by something that was digitally created post-filming. Was the gator scary in the film? (I’m asking, lol.) It looked scary from what I saw on the online promotional material. 🙂 A highlight was getting to shoot a rifle between scenes, which was quite an experience. I never got to see the film (though people including my mom and aunt kept telling me they’ve seen it), so I didn’t know that about the girl not coming back with the first-aid kit!! That’s hysterical. Most of the autograph requests I (still) receive come from LOST fans. Besides Five-0, LOST was one of the best TV filming experiences I’ve had. Although it seemed to be a brief exchange with Dr. Shepard (Matthew Fox), the filming process was rare for a TV show in my experience, because this process was like shooting a film where telling the story took precedence. Blocking was consciously considered and rehearsed so it made sense in the story. By the time we filmed, it was second nature. I feel the success of that show (besides the incredible talent and imaginative storylines) were due to the efforts made to tell the story. After having auditioned for 4 seasons without any callbacks, to have been a part of LOST history (not to mention Lostpedia 😉 continues to be a blessing, as the program continues to air throughout the world. Reposted with permission from ValenTumblr. Tamlyn Tomita, Valentino Valdez, and Traci Toguchi at the HIFF screening of The Karate Kid Part II . Graphic artist, movie geek, and awesome dad are probably the best ways to describe Guest Manager Valentino Valdez. You can find more of Tino’s work over at ValentinoValdez.com and follow his exploits on Twitter @valdezign.